Lilith getting her hair caught in the door is something I've really been wanting to add into the comic. I want it to become sort of a running gag with her (her hair is crazy long after all). 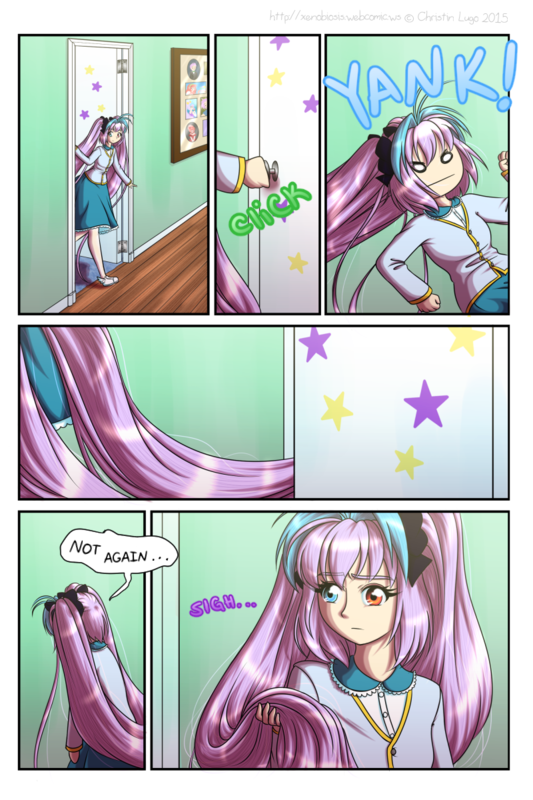 I thought it'd be funny to show her super long hair getting caught and being sat on and kind of being in the way in contrast to other super long anime hair that just magically stays out of the way when the person sits down or walks through a door. So you can expect this type of thing to show up more in the comic in the future. I may or may not be changing the dialogue font, the one I'm currently using was made from a variant of my handwriting and when the text is smaller a lot of the skinnier letters meld together, making it hard to read some words. Luckily for me there isn't much dialogue that'll need to be changed if I do decide to switch to a different font. And luckily for all of you, things will be easier to read. I really like the stars on Lilith's bedroom door. It's cute and you can tell that's her room but it's also a fairly normal thing for a teenage girl to do, I think. My own bedroom door was covered in stuff when I was a teenager (Fullmetal Alchemist art I'd clipped from magazines and printed off the internet and such) so I think it's a nice little detail to have. I really like this page, even if the perspective in the first panel killed me. The perspective on page 5 and 6 will be worse though. Darn perspective. Oh there's also the little tiny pictures in the picture frame, but I'll talk about those more next week. Mmmm I think that's everything for this week. I caught some kind of cold or something so I've been mildly sick the past week, so that mixed with my absent-mindedness and some cold medicine led to the page being late today. I promise I'll be on time next week! Lol, that was super cute. Yes, it's going to do the one job hair has. Well, apart from looking pretty. And that's inconvenience the person with said hair!! This looks really impressive. I love how shiny the hair is and the layout of the room. Haha, poor girl. I know that song and dance. Also the coloring is great, you can really get a feel for the texture of everything, and the hair is so pretty! And I looooove drawing hair, despite the routines poor Lilith has to suffer through with her ridiculously long hair. Mine never got past 50 cm(~2 feet), but I had situations like this too. Worst one was when my cat used is as ladder to get on my bed. ouch. You know, they never show anthros having this problem either. You have to suffer to be awesome comic people! Just... it makes sense to show?? I think it's weird when stuff like this doesn't happen?? I dunno, it's something I see rarely if at all, so I decided to have hair problems plague my characters (especially Lilith with her super long hair and Canan with his long wavy hair). You know what's funniest to me? My name is Lilith... and this has actually happened to me. Long hair is great and all, and it looks really nice, but you gotta be careful with it. Cause that HURTS. That sort of running gag is PERFECT!!!! Great, keep it up! At this rate we'll brainwash her into having short hair all over and she'll lose all her powers! Then we can take over the woooooorld! And so Lilith discovered the wonders of braids and the world was forever changed. And she then said "Go forth, free of pain! For no longer shall long hair be caught in the dreadful door, nor sat upon by accident! No longer shall hair be found amongst one's food, nor blown into thine eyes by the troublesome wind!" For she had discovered the miracle of braids. And all was well.